Hot Cross Buns: shaken or stirred? Portobello Road Gin have been getting a little experimental in the kitchen ahead of Easter. The results of those hours spent slaving away in a kitchen, with the ever-so-difficult task of cocktail creation, have resulted in an Easter cocktail that couldn't be more different to the usual sickly sweet chocolate concoctions served in an Easter Egg. Instead, they've created something altogether more sophisticated; The Not Cross Bun Martini. Masterfully combining two delicious British institutions, the Hot Cross Bun and London Dry Gin, the sippable sensation is inspired by Portobello Road Gin’s passion for all things British. 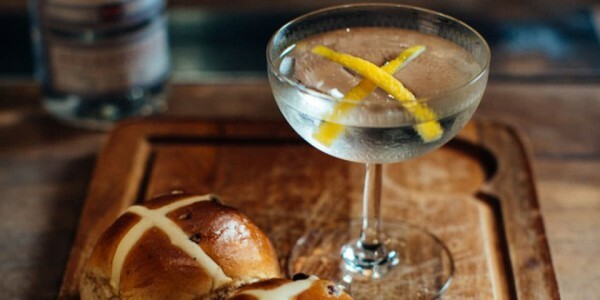 The Not Cross Bun Martini has been developed by distilling high strength alcohol with Hot Cross Buns, creating a super-concentrated essence which is then sprayed into a frozen glass. The cocktail is served with raisin-infused dry vermouth and garnished with a lemon cross. Portobello Road Gin’s team of experts are no strangers to creating wonderful flavour combinations. The brand’s limited edition ‘Director’s Cut’ asparagus gin was the world’s first London Dry Gin to use asparagus as a botanical. Lea & Perrins Saucce and Yorkshire Tea are just two other classic British favourites that the brand has successfully married with it’s award-winning gin.